ATTACH PO AS A PDF - ONLY ONE PO (WITH QUOTE) PER ATTACHMENT. Our team of engineers has over 25 years experience in networking, wireless, routing and switching, firewalls, server administration (Windows and Linux), desktop and server virtualization, storage and IP-based phone systems (VoIP / telephony). We provide top-tier support to anyone looking to move servers, databases, files, software, services, etc. to the cloud. Our experience with cloud services providers like Amazon Web Services (AWS) and Google Cloud Platform keeps us on the cutting edge of cloud-based solutions. We have developed over 500 applications including mobile apps for field workers to use remotely (on the job, away from a computer), educational games, file management desktop applications, responsive customer-facing sites, and many more. 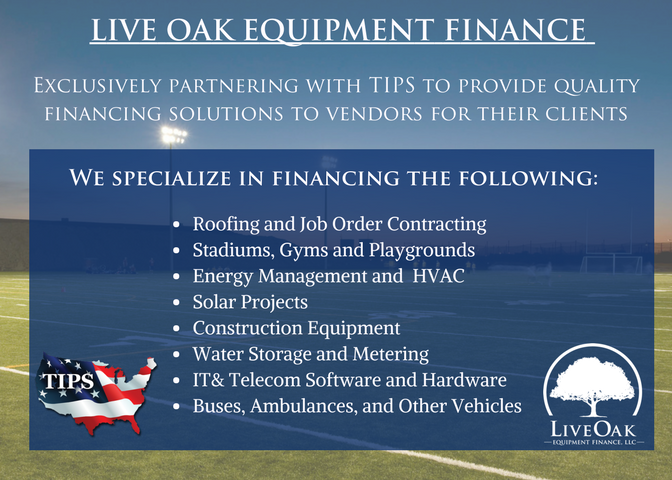 Live Oak Equipment Finance is the exclusive financial parter of TIPS! Allow LOEF to help assist you in your financial needs today! We are committed to provide a financing experience based on unwavering integrity, unmatched service and complete transparency. Our processes have been established with the client in mind, and we are dedicated to ensuring that you enjoy your experience working with our team. 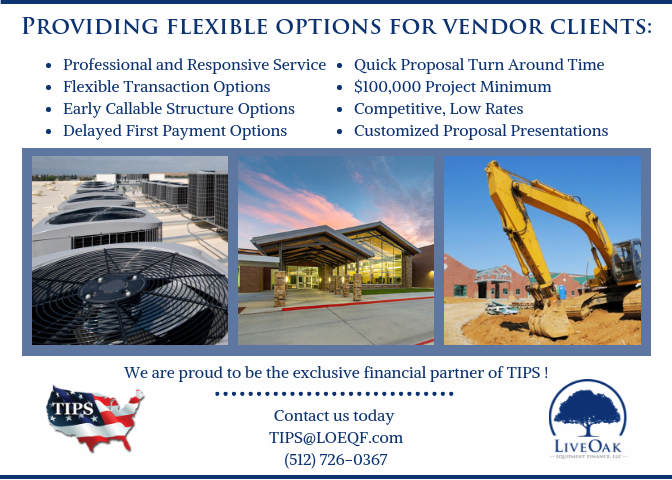 Our goal is for you to build a long-term relationship with Live Oak Equipment Finance, not only as your financial partner, but also a firm that can help you grow and excel as a professional in your industry.